Monarch Air Group provides private air charter in Eugene, OR. Our clients benefit from top-notch service, unrelenting dedication to safety, wide selection of aircraft, and years of experience in chartering private jets. To obtain a free quote, please use our online quoting tool provided below, or call toll free 1-877-281-3051. Monarch Air Group provides private jet charter flights in and out of Eugene, Oregon, USA. Eugene is the second largest city in west central Oregon, on the Willamette River. The population of the city is about 156,185 people. 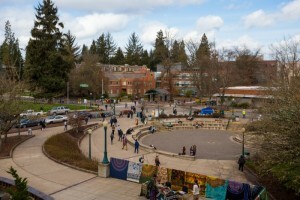 It is home to the University of Oregon. Often called “Emerald City”, and “Track Town, USA”, Eugene offers natural beauty, numerous recreational opportunities including bicycling, kayaking, rafting, running, activist political leanings, the arts, and residents with “alternative” lifestyles. The most popular tourist attractions include Hult Center for the Performing Arts, Cascades Raptor Center, Hayward Field, Bijou Art Cinemas, Jordan Schnitzer Museum of Art, Springfield Museum, Hendricks Park, ComedySportz Theater, and much more. The city is served by Eugene Airport (EUG / KEUG), which is located 12 miles from the center of Eugene. 1. CVO, Albany, Albany, United States. 2. EUG, Eugene, Eugene, United States. 3. ONP, Newport, Newport, United States. 4. RBG, Municipal, Roseburg, United States. 5. SLE, Mcnary Field, Salem, United States. 1. Marriott : Courtyard Eugene Springfield, 3443 Hutton Street, Springfield. 2. Holiday Inn Hotel Eugene N – Springfield, 919 Kruse Way, Springfield. 3. Holiday Inn Express, 2117 Franklin Boulevard, Eugene. 4. Red Lion Hotel Eugene, 205 Coburg Road, Eugene. 5. Marriott : Courtyard Eugene Springfield, 3443 Hutton Street, Springfield. 6. Holiday Inn Hotel Eugene N – Springfield, 919 Kruse Way, Springfield. 7. Holiday Inn Express, 2117 Franklin Boulevard, Eugene. 8. Red Lion Hotel Eugene, 205 Coburg Road, Eugene. 9. Marriott : Courtyard Eugene Springfield, 3443 Hutton Street, Springfield. 10. Holiday Inn Express, 2117 Franklin Boulevard, Eugene.